Residents of a north-east town are “breathing a sigh of relief” after it was revealed one of its most iconic tourist attractions will be open in time for the new season. The Press and Journal revealed last week that Stonehaven Open Air Swimming Pool could potentially miss its traditional opening date on the final weekend of this month. Aberdeenshire Council had confirmed an ongoing health and safety inquiry had delayed essential maintenance works from being carried out at the 164ft pool. The Health and Safety Executive (HSE) launched an investigation in February after a pensioner fell from scaffolding and injured himself while volunteering with the Friends group that maintains the 1930s pool. The delays had spread panic that the facility might not be open in time to welcome the thousands of visitors and locals that come to sample the heated salt water. But the local authority has now confirmed its contractors have finished the maintenance work and it is “confident” the facility will open on May 26. It is understood the pool was being filled up with fresh water yesterday. Stonehaven councillor Wendy Agnew, who previously described the facility as the town’s “jewel in the crown”, welcomed the news. “I’m delighted that the council has confirmed that it will open on time,” she said. “I think people were getting very worried around the town as the date drew nearer. Everyone is breathing a sigh of relief. 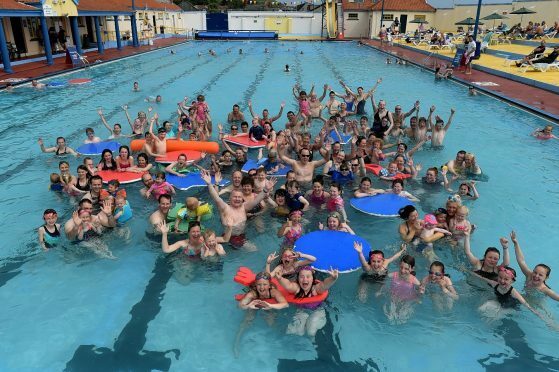 Pete Hill, chairman of the Friends of Stonehaven Open Air Pool, said: “We are delighted to hear that Aberdeenshire Council has confirmed that the pool will open as scheduled on May 26.